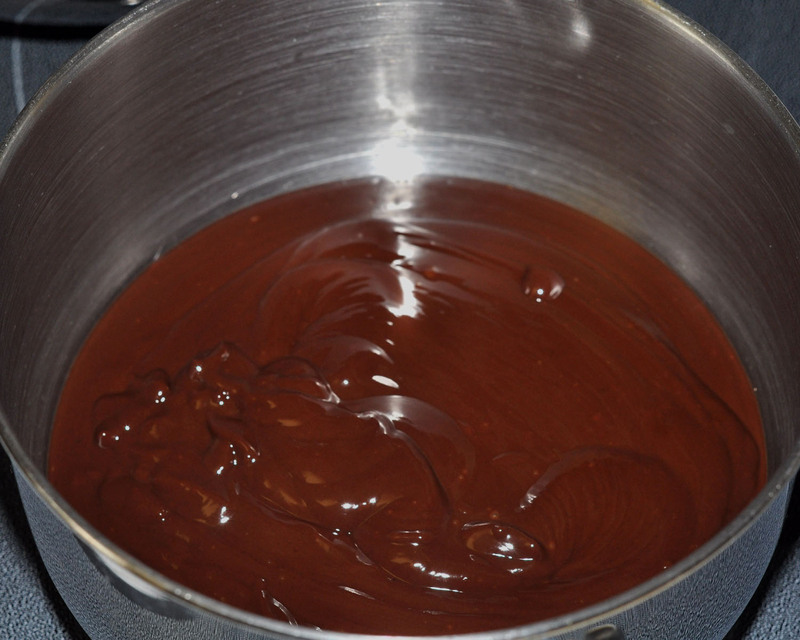 Chocolate ganache icing is the most rich, decadent icing. For the chocolate lover in your life, this is the only way to cover a cake. It is, however, also a kind of tricky icing to make, and even harder to get on the cake nice and smooth. You can do it, though. It just takes a little practice. 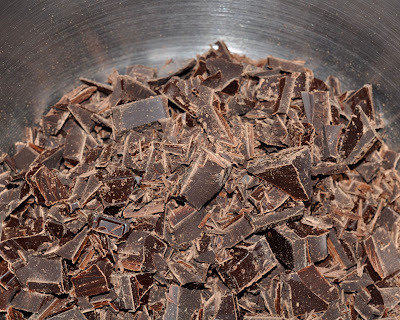 Begin by chopping your chocolate into small bits. (This is Baker's brand chocolate. You can use any you want. I love the Ghirardhelli Chocolate disks you can buy, but sometimes I opt for a little cheaper.) Place them in a heatproof bowl. 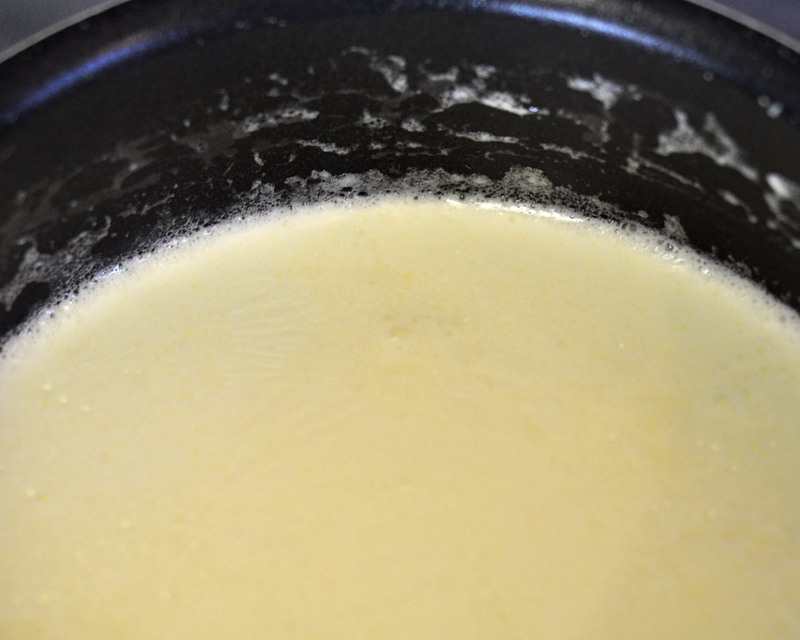 Heat the cream in a saucepan until you see small bubbles along the sides. DO NOT LET IT BOIL. Using a wire whisk, mix the chocolate and cream together. It may look kind of weird (like the photo above) at first. Don't worry. It will come together. After a little whisking, this is what you get. Shiny, smooth, chocolatey yumminess. And then there's more waiting. 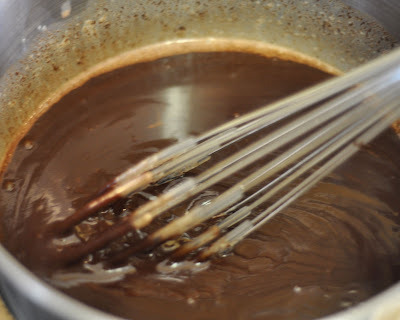 Before you can put it on the cake, you need to let it cool until it is the consistency of thick pudding. 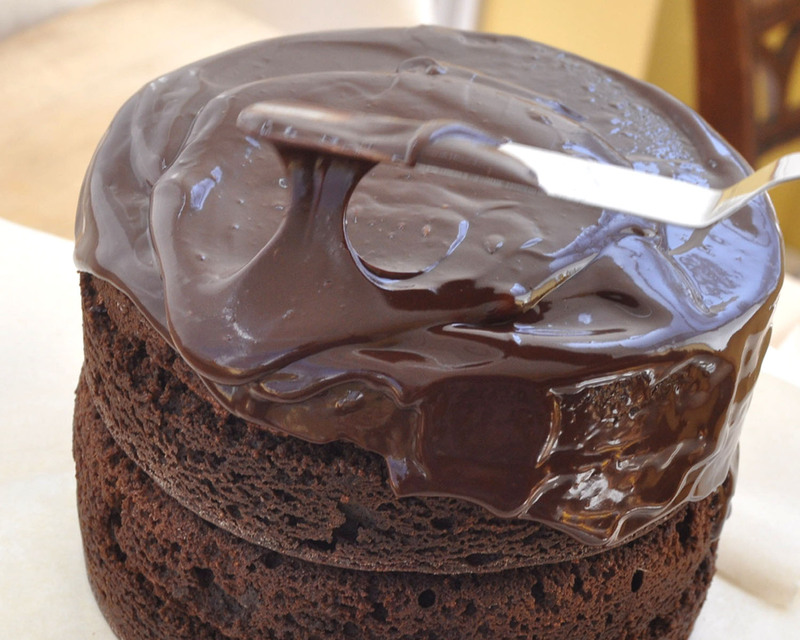 You'll know it's the right consistency when you can push it off of the top of the cake, and it doesn't pour all the way down. It slowly works its way down the side. That allows you to spread it before it puddles at the bottom. 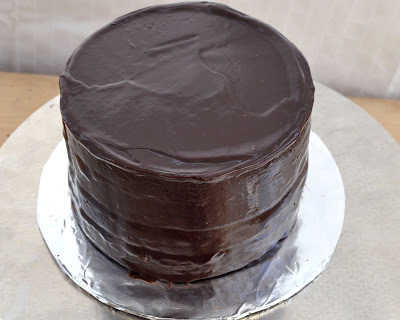 I recommend placing pieces of waxed or parchment paper around the bottom, though, to help protect your cake plate from large dollops of ganache. 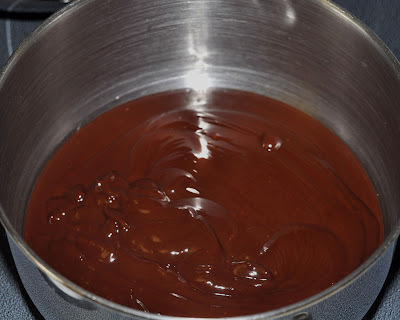 To smooth the ganache, just go around in as few strokes as possible, once you have the whole cake covered in the icing. The technique to cover the cake is pretty much the same as the one found in my tutorial on how to cover a cake with buttercream, it just drips down the sides instead of hanging over the sides. 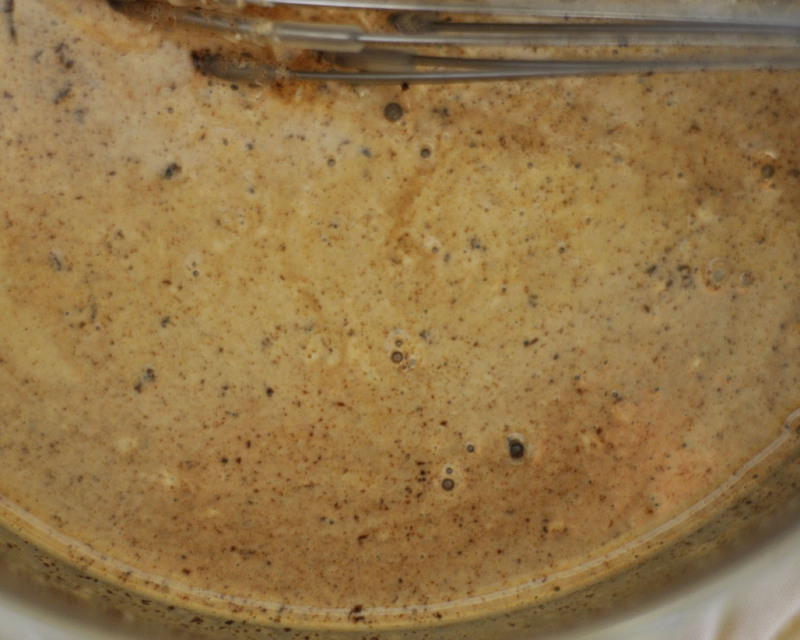 This icing, and any cake covered with it should always be stored in the refrigerator. 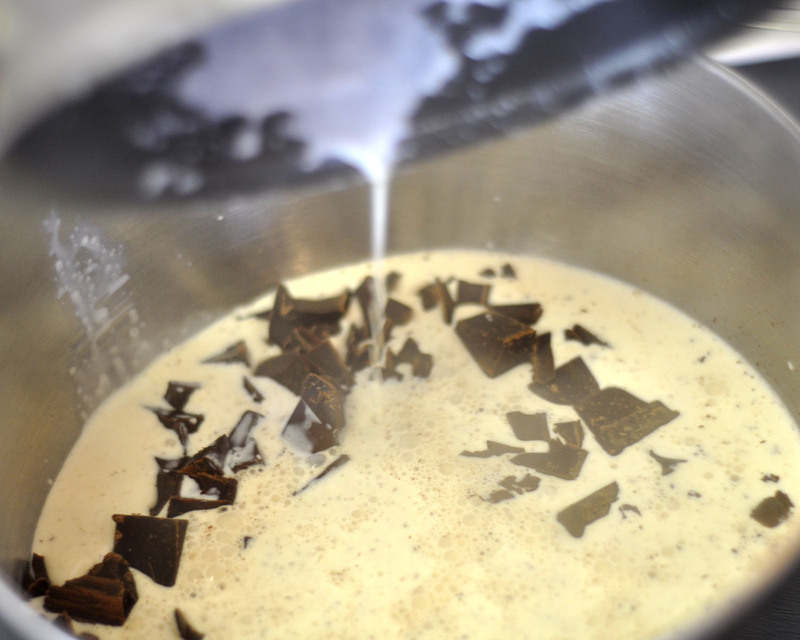 You'll want to bring it out to room temperature before serving. It does not reheat well, but it does make some amazing "s'mores" coupled with graham crackers and marshmallow fluff.